Nekropolis Shahi-Zinda, Architectural monuments of Uzbekistan, Sights of Uzbekistan, Sights of Samarkand. Nekropolis Shahi-Zinda (“The living King”) is one of the great ancient architectural ensembles of Samarkand, situated on the south-eastern part of Afrasiab. Ensemble includes mausoleums and other religious buildings of XI, XIV and XIX centuries. The name of Shahi-Zinda is connected with legend. It is said that cousin of Prophet Muhammad, Kusam ibn Abbase arrived in Samarkand to preach Islam but he was beheaded, despite he managed to go down into the well where allegedly he has still been living. Complex Shahi-Zinda includes more than 20 buildings. The ensemble is divided into three groups: lower, middle and upper. The top group consists of three mausoleums. The earliest of them is Hoja-Ahmad mausoleum. There is a complex on the left which consists of mausoleum, mosque and hujr. It was built at the beginning of the XV century. The middle group consists of mausoleums built at the beginning of the XIV and at the end of the XV centuries. All buildings have the connection with Tamerlan’s relatives. There is a mausoleum Shadi-Mulk-aga on the west side. She was Tamerlan’s nephew. The construction is a portal-dome, single-chamber crypt, built in 1372. 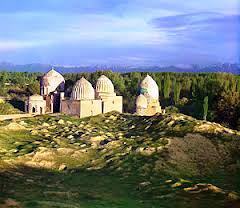 On the contrary there is the mausoleum of Timur’s sister – Shirin-Bika-aga. The lower group is the most proportional with two domes building, located at a multy-stage ladder. The mausoleum was built at the beginning of the XV century. Some of these buildings with blue domes, high portals and patterned stone arches were restored by architects under the direction of the famous archeologists. Having visited the mausoleum Shahi-Zinda, you will be able to know architectural school of Samarkand and Central Asia. In its construction the architects used carved terracotta, large mosaic and relief majolica. It is important to note that Shahi-Zinda is the unique architectural monument in Samarkand in which was reflected almost 25-century history of the city.